Today is the last day of the Positivity Experiment. When I Started off with it, I thought it would be difficult to find five Mood Uplifters everyday. But surprisingly it hasn’t been that tough. Over the last few days I have realized that its simply all about attitude.If you WANT to feel positive and Happy, even small things will make you happy, but if you are bent upon being miserable and complaining about things; nothing will make you happy. This experiment gave me an entirely new perspective about life. I learnt to count my blessings and realized that all I have to do is shift my focus from the negative to the positive to realize how enriching and happy my life actually is ! 1)We`ve had lovely weather since morning. Its been raining off and on but instead of becoming humid, the weather is very refreshing and cool.Just like a hill station ! Delhi summers have suddenly become very pleasant ! 2)I played Mastermind today after a long time. I love this game and have been playing it since I was a kid. And guess what I won ! 3)I had Bhutta (corn on the cob) in the evening. After Pakoras, that’s my second favorite thing to eat in the monsoons ! 4)Discovered two very well written blogs that I think I would like to read on a regular basis. 5)We have a sort of community pet. A cat who lives around the park. She just had kittens, and those furry little things are one of the most adorable creatures I have seen in a long time. I spent a lot of time watching them frolick about and learn how to climb a small tree. The smallest kitten of them all, managed to climb up looked down with what I imagined was a triumphant look, then promptly lost its footing and came tumbling down. It was hilarious to watch ! Although this is my last post on the 7 Days of Positivity experiment, we are keeping the magic alive here. Please do join us ! FANTASTIC!! YOUR experiment ended up teaching ME a lot!! Lots of cheers and hugs. @Sandy - Thanks ! glad u liked it ! @Dhanya - yeah I am done with it ! but will continue to look for positivity everywhere ! @Swaram - Thank you for reading ! Glad u enjoyed it ! @soorya - Thanks and welcome to my blog ! :) Ya it was indeed absolutely great to reflect on small things which give lasting happiness. 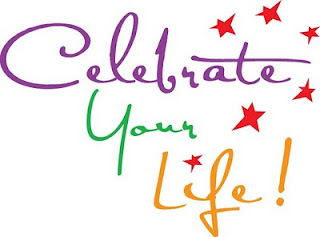 I loved that last line - "Celebrate your life"